Full of gripping illustrations that bring the scriptures to life, this anthology of sermons for the entire church year offers readers a treasure trove of spiritual guidance. 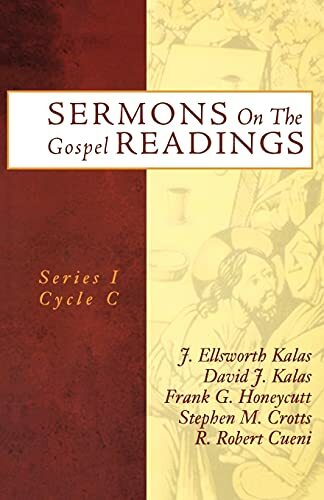 Five distinguished preachers representing a variety of denominations and ministry settings contribute messages based on gospel texts for each Sunday and major celebration in Cycle C of the Revised Common Lectionary. Their thoughtful meditations proclaim the good news for today's world and exemplify the transforming power of God's word in our lives. Unforgettable in their power and biblical witness, these sermons provide readers with strength, support, and a Christ-centered vision. Frank Honeycutt's sermons are exciting in their evocative power. His narrative ability is a real gift that enables these messages to illumine the word of God and human life so that a listener is drawn into the word and encouraged to reflect, remember, and think about life in terms of God's activity. These sermons reflect a pastor whose imaginative juices flow mightily. I am impressed by the sense of urgency in Robert Cueni's messages. When the specter of my immediate death flashes before me, I want to know that I have lived toward God's reign with all that I have. These sermons help transform me in that direction.